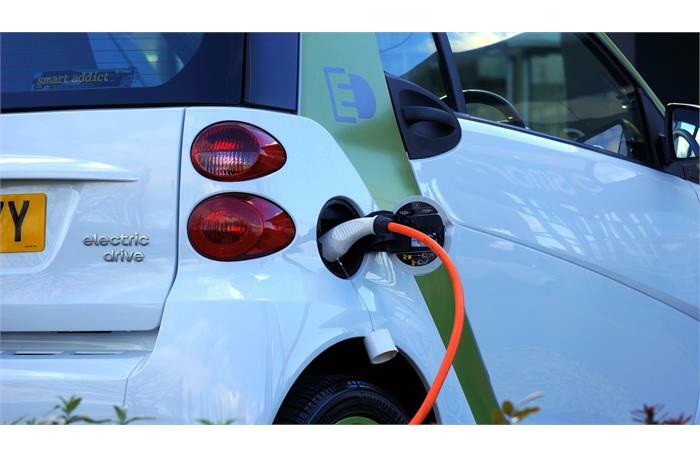 Auto Volo UK | Blogs | Electric Vehicles - Should We Believe The Hype? What does the trajectory look like for electric vehicles vs. fossil fuel powered cars? Electric Vehicles - Should We Believe The Hype? There's a lot of hype surrounding electric cars. A LOT. They've been painted as the silver bullet solution to global warming and the future of transportation. Elon Musk even launched one into space. However, in all this hype it's possible to lose sight of the facts. So, in this article, I want to take a deep dive into some of the data out there about the environmental impact of both electric cars and their fossil fuel burning cousins. By taking a look at the numbers, a clearer picture of the pros and cons of each should emerge. I'll start by looking at vehicles that are powered by burning fossil fuels. The two main candidates here are petrol and diesel, although cars that run on lpg are also an option. As it currently stands, in 2018, petrol and diesel completely dominate the market. And although diesel cars have had a lot of bad press recently following the dieselgate scandal, there are more diesels on the road in UK now than ever before. It will come as no surprise that this almost complete reliance on fossil fuel based vehicles is often quoted as one of the main stumbling blocks in making society greener and more environmentally friendly. It's for this reason that many European countries are moving to phase out and ultimately ban the sales of petrol and diesel cars. For example, France will ban sales from 2040. Car manufactures are also responding with increased focus on hybrid and fully electric cars. In Volvo's case, they're completely abandoning the manufacture of petrol and diesel cars by 2019. Perhaps the greatest motivating factor behind these decisions to transition away from petrol and diesel is the carbon emissions of these vehicles. The Paris Agreement is a global treaty on climate change that set to limit the rise in global temperature to 1.5°C. As most countries are signed up to this treaty, this means that governments must act to try and limit carbon emissions. Carbon emissions are partly responsible for global climate change, as CO2 is a greenhouse gas. Because petrol and diesel cars burn their fuel, carbon present in the fuel is released as carbon dioxide. As levels of carbon dioxide and other greenhouse gases increase in the atmosphere, this causes the average global temperature to rise. According to EU studies, fossil fuel burning cars make up 12% of the EU's total carbon emissions. So, a transition away from these kinds of vehicles would have a significant impact on reducing CO2 levels in the atmosphere and thus help to reduce the rising global temperature due to greenhouse gases. A closely related point is that fossil fuels are not renewable sources of energy. Both petrol and diesel are derived from oil. Global oil stocks are a finite resource, and as demand increases these resources are depleted at a faster and faster rate. In their yearly report from 2017, BP predicted that at the current rate of oil consumption the world has 50.2 years of oil remaining. However, the same report also shows how demand for oil increases each year. This means that at current rates of consumption, petrol and diesel powered transportation will not last beyond this century. Of course, new oil reserves could be discovered but this is not a long term solution. Moving away from fossil fuel burning cars could decrease demand on oil stocks. This would mean that oil stocks would last longer. This is incredibly important, as oil is used to manufacture many things - from plastics to medicine. Furthermore, the extraction of crude oil from the ground and its conversion into usable petrol and diesel is itself a carbon intensive process. This means that moving away from fossil fuel burning vehicles could provide a two-fold reduction in carbon emissions. Besides the carbon emissions, other gases and particulates are released in a vehicle's exhaust fumes. While modern cars are rigorously tested, and have never been cleaner, these exhaust fumes still contain harmful substances. Recently, this has been brought to light with the 'diesel gate' scandal, where it emerged that VW had been falsifying results on emissions tests to hide the true level of polluting nitrous oxides. Diesel in particular have been singled out because when burned, diesel can produce nitrous oxides and particulates. Both have been linked to a range of health problems. However, it is important to bear in mind the age of the diesel here. Brand new diesels are all fitted with particulate filters, so are far cleaner than older diesels. Similarly, from 2015 onwards, all new diesels had to follow strict rules on nitrous oxide levels. 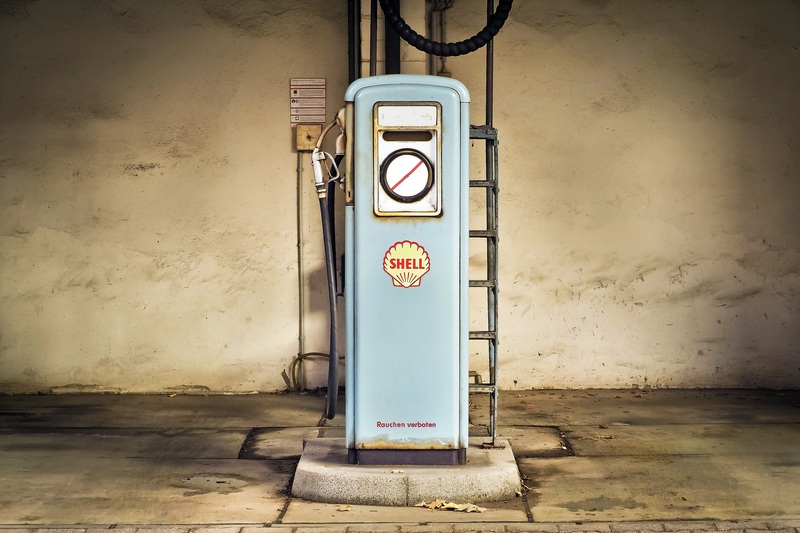 These strict rules mean that actually, some petrol cars will actually emit more harmful nitrous oxides than some diesel cars. Worries about air pollution are particularly acute in large cities, where traffic is in close proximity with large populations. Pictures of Beijing and New Delhi swamped by smog are a common sight. However, closer to home, London has suffered illegal levels of air pollution since 2010. Much of this is due to traffic, as can be seen by studying maps of London's air qualitythat show busy roads as the chief offenders. 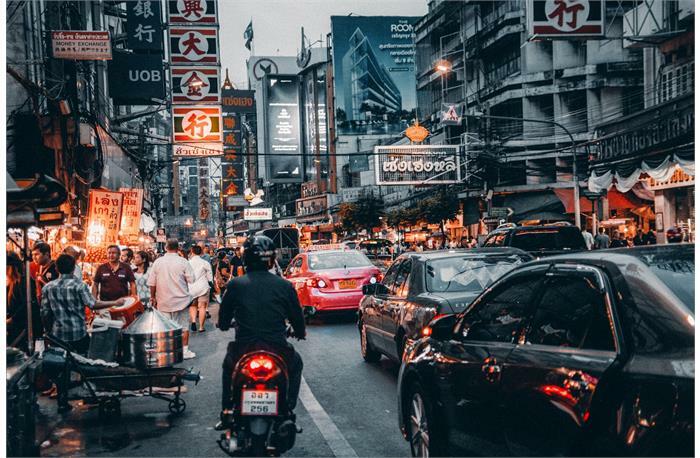 Worries about air pollution have led many cities to begin the process of banning the most polluting cars from city centres and busy pedestrian areas. Such bans would not apply to any vehicles that did not burn fossil fuels. So far, I've said a lot about how petrol and diesel cars are bad for the environment. However, it is certainly worth dwelling on the positives for a moment, before I move on to discuss electric cars. Since Karl Benz built the first automobile in 1885, the technology in petrol cars has been continually improving. The internal combustion engine is perhaps one of the most refined and established technologies in existence. This has three huge environmental advantages. First, modern cars are incredibly efficient and have been designed to be as environmentally friendly as possible. These efficiencies have increased year on year, with the European Commission reporting that, since monitoring began in 2010, the average CO2 emissions of new cars have fallen by 16%. In fact, there are some reports that suggest a diesel will get more miles to the gallon than a hybrid car will on the motorway. Secondly, modern petrol and diesel cars will have long life cycles. While many people still regularly trade in their cars for newer models, these used cars remain in circulation for a long time. Parts are readily available, and modern cars can continue running into the hundreds of thousands when it comes to mileage. This can be good for the environment. The manufacture of a car is a resource intensive process. So the longer that car can last before it is scrapped means you get the most value out of that initial investment of resources. 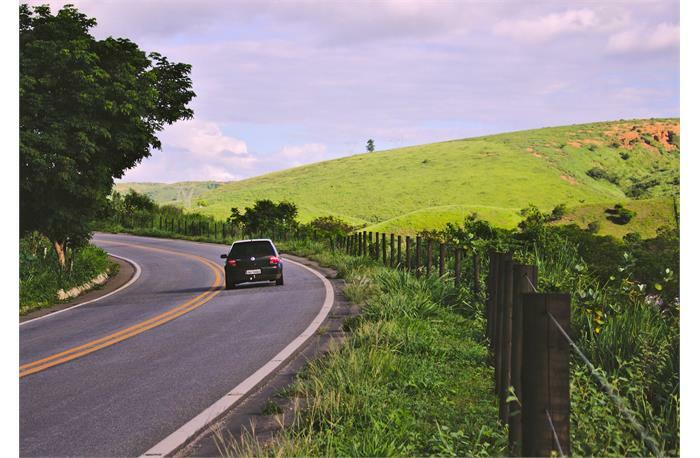 In fact, even though an older car may get poorer mileage, it may still be greener to keep it running than to buy a new one. Thirdly, the ubiquity of the technology involved in a modern fuel burning car means that up to 80% of it can be recycled. Furthemore, many carmakers are now using recycled materials in the construction of new cars. This can have a huge effect on the environmental impact of a car, an effect that is often missed if you focus only on emissions statistics. Another environmental benefit of a traditional, fossil fuel burning car is that the manufacturing process itself has been constantly improving. 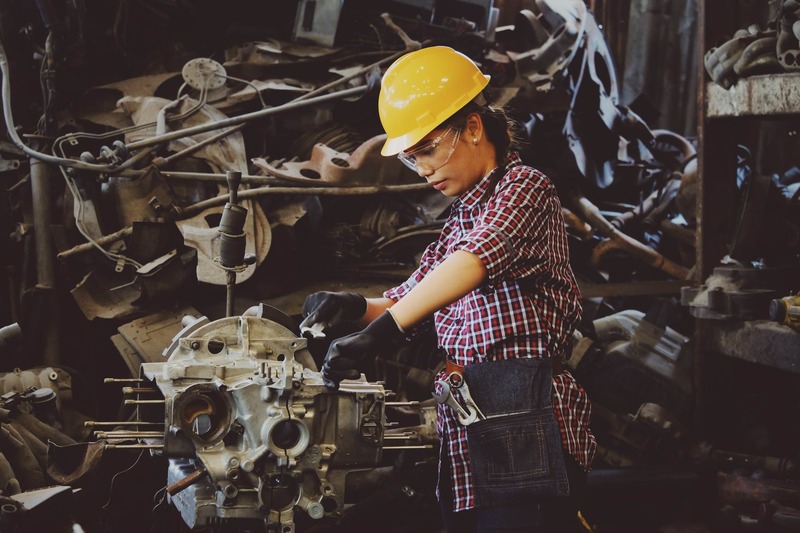 These efficiencies mean that the construction of a petrol or diesel car is commonly cleaner than the production of a hybrid or electric vehicle. Typically, for a fuel burning car, the production process is equivalent to 5.6 tonnes of CO2 emitted. This is nearly three tonnes less than the average for an electric car (see this report). Of course, these stats are only averages, and this can vary wildly between manufacturers and models. Another thing to consider here is that, over time, electric vehicle production will also become more optimised and efficient. However, this still illustrates one way in which petrol and diesel cars still have an environmental edge over their electric competitors. Electric vehicle ownership is on the increase. 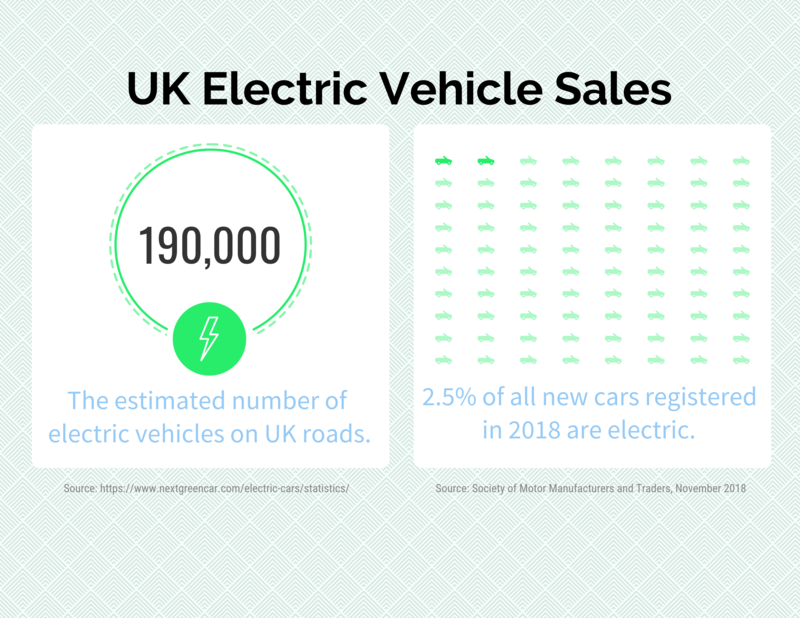 In fact, in the UK, since 2013 ,there has been a year on year increase in new electric vehicle registrations (see infographic). By the end of October 2018, electric cars make up 2.4% of the year's vehicle registrations. So, while there's clearly a growing interest, electric vehicles still make up very little of the total amount of cars on the road. As I have discussed above though, manufacturers and governments are shifting their interests more towards the electric market, so we can expect that the amount of electric cars on our roads will continue to rise. 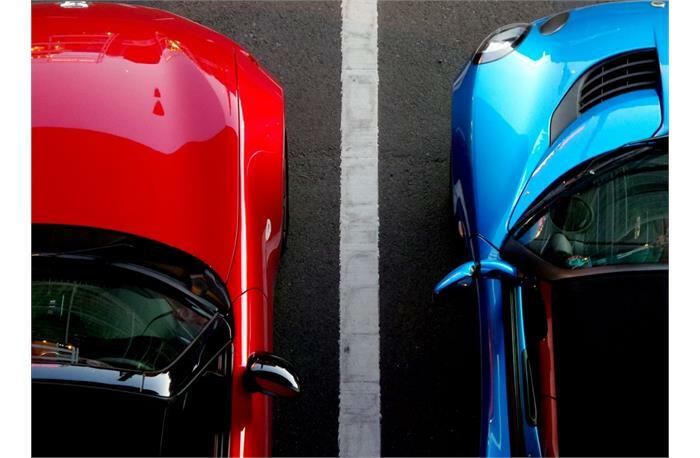 In the UK, there are a range of tax breaks available for those who buy an electric vehicle or hybrid with very high mileage: on top of not needing to pay road tax on electric cars below £40k, by using electricity rather than petrol or diesel, you avoid both VAT and fuel duty. Furthermore, the UK government has pledged to have half of all new cars sold by 2030 to be electric. 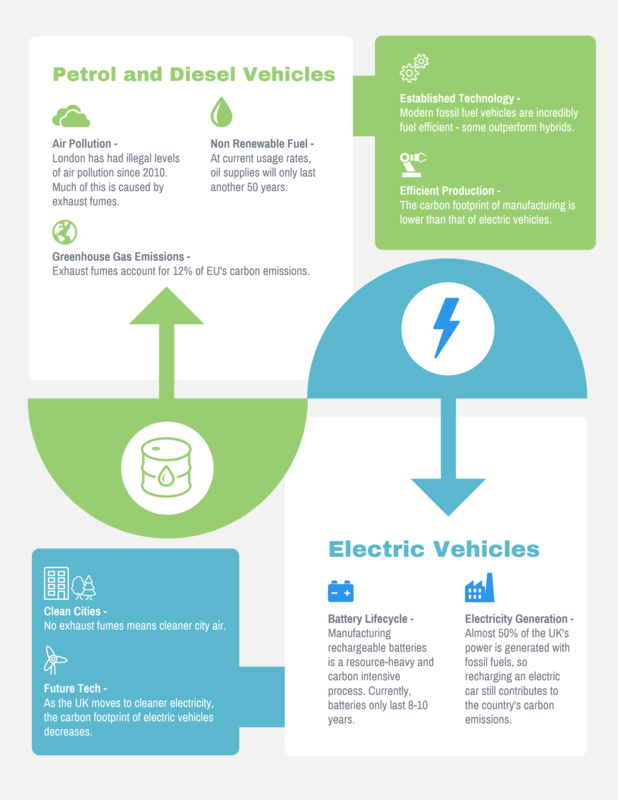 So, with the continuing rise in popularity of electric vehicles, it is certainly worth looking a little closer at the environmental impact they would have. The most obvious benefit of fully electric cars is that they have no exhaust. The cars themselves do not emit any gases at all. This means that there is no carbon dioxide being added to the atmosphere when you drive. This means that electric cars have the potential to be completely carbon neutral, provided they are using renewable electricity to charge. As I mentioned earlier, petrol and diesel vehicles account for 12% of the EU's CO2 output, so a shift to electric vehicles could see a sizeable reduction of CO2 emissions. Perhaps even more importantly, the lack of exhaust means that electric vehicles will not directly contribute to air pollution. This means that increased adoption of electric vehicles within cities would help to improve air quality. This study looked at Barcelona and Madrid, and predicted significant drops in the amount of harmful nitrous dioxide in city air with the take up of electric vehicles. Poor air quality in UK cities is a health risk, so in this respect electric vehicles could literally improve the health of the nation. 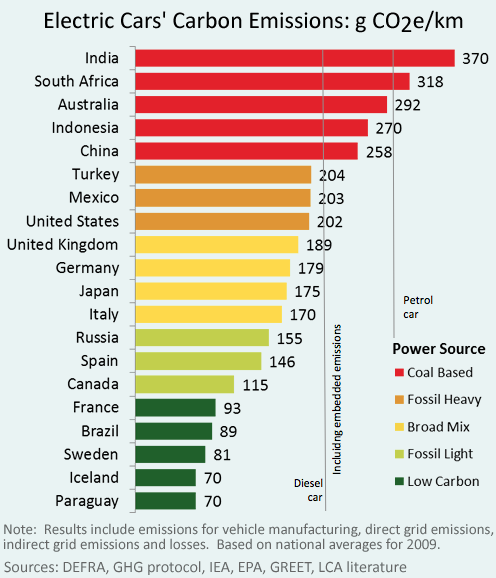 Although electric vehicles are zero-emissions, the power plants that charge them are often not. So, while you are not burning fuel in your car, you may still be contributing significant levels of carbon to the atmosphere when charging your electric vehicle. This of course depends on where you live and how the electricity you egt at home or at a charging station is generated. 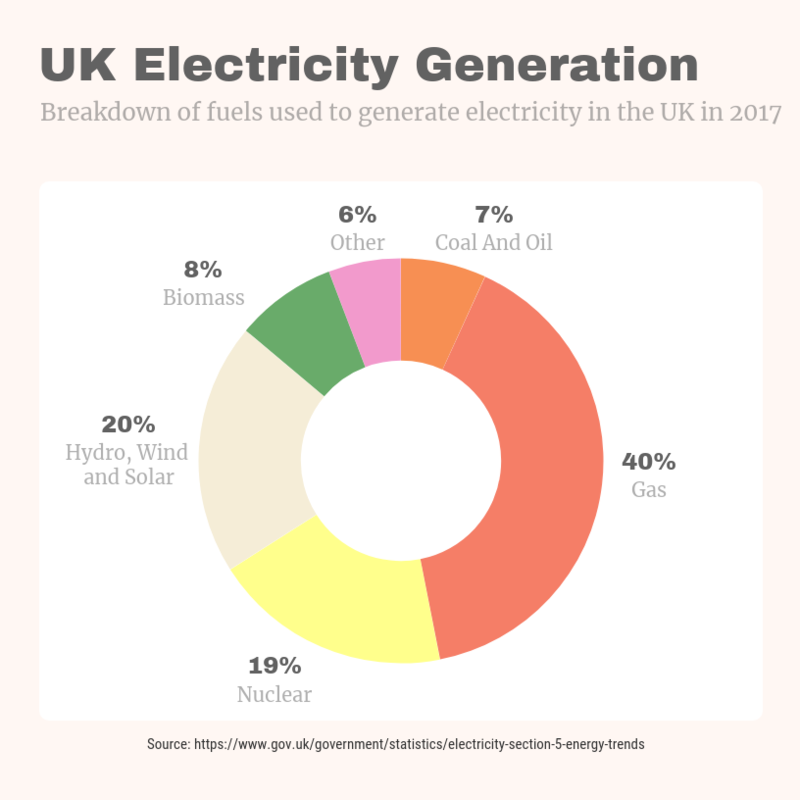 In the UK, just over 47% of electricity is generated by burning fossil fuels (see infographic). Although the majority of this comes from natural gas, which is the least polluting fossil fuel to burn, this still contributes a considerable amount of carbon to the atmosphere. Crucially, this means that charging and driving an electric car in the UK will still result in carbon emissions. So, your electric car will not be carbon neutral while driving. On the other hand, if you live in Portugal, where there has been heavy investment in renewable energy infrastructure, the case would be very different. For example, in the month of March, 104% of Portugal's electricity was generated by eco-friendly, renewable sources. So, charging and driving your electric car there would have been carbon neutral. If countries increasingly move away from fossil fuels for generating electricity, then electric cars will become more and more carbon efficient. A related worry is that as electric cars become more common, this will increase the demand for electricity. This will reverse the current trend of declining demand brought about by energy efficient appliances. The question then is whether this extra demand is met by clean electricity, or whether it leads to an increase in use of fossil fuels. How this plays out will have a profound effect on how eco friendly electric vehicles really are. Finally, there are around eight hundred and forty thousand homes in the UK with their own domestic solar panel system. While the growth in this area has stagnated recently, this presents another way in which electric vehicle technology can be green, because having a domestic solar set-up can reduce your reliance on the grid and its use of fossil fuels. Not to mention the fact that you're refueling your car for free! One area of concern for electric vehicles compared with petrol and diesel is the production of batteries. Electric vehicles require huge batteries to compete with the range of fuel burning cars. These batteries require both materials and processes that place a strain on the environment, both in terms of carbon footprint and ecological damage through mining and waste. Most manufacturers do not have the capabilities to produce batteries themselves, so there is also a considerable amount of shipping involved in the production of electric cars. Also, rechargeable batteries often use lithium, a rare and difficult to mine element. This means that a brand new electric car will, on average, have a larger carbon footprint than a brand new petrol or diesel car. However, this balance will quickly swing in favour of the electric car as you own it for longer. Some estimate that once an electric car reaches the two year mark, it has paid off this increased carbon debt and is now greener than an equivalent petrol or diesel. So, over the course of its lifecycle, an electric car will be more carbon efficient. There is an added worry here that rechargeable batteries lose capacity over time. Most manufacturers offer and 8 to 10 year warranty covering battery life. So, this does mean that the lifespan of an electric car's battery is lower than the engine of a petrol or diesel powered car. This again impacts on the carbon footprint, as a replacement battery represents a significant investment of global resources. It is worth noting that battery technology is the subject of concerted research efforts and innovation. Most new consumer technology contains a rechargeable battery, so research and development across the world is devoted to making batteries that last longer, charge faster and are cheaper and greener to make. This means that we can expect both the lifespans of batteries and the environmental cost of their production to improve. Furthermore, companies are trying to finder cleaner and safer ways to get the materials for battery production, for example Tesla have promised to use only North American suppliers for battery production in the US, with a focus on recycled cobalt and synthetic graphite to avoid excess mining. Somewhere between petrol and diesel cars and the electric car sits the hybrid. This is a car that combines both a rechargeable battery and an internal combustion engine to drive the car. Essentially, fuel is used when necessary, although the car uses electricity whenever possible. There are two types of hybrid, plug-in or standalone. A plug-in charges the same way an electric car does, by plugging into mains electricity. However, it also has a fuel tank that can be used to drive the car once the electricity runs out. Standalone does not draw electricity from the mains, instead it uses petrol or diesel to charge the battery. Plug-in hybrids largely have the same advantages and disadvantages as electric cars - the manufacturing process is more intense, but in the long run, they are more carbon efficient than vehicles that solely use petrol or diesel. However, due to the fact they still use petrol or diesel, they do still contribute to both air pollution and greenhouse gas emissions. Standalone hybrids also have a more resource intensive manufacturing process than petrol and diesel cars, as they still require a rechargeable battery. However, the fact that they generate power by burning fuel means that they have emissions levels that are much higher than electric vehicles although they are still far cleaner than petrol and diesel cars. Ultimately, hybrid technology represents a kind of middle ground. For this reason, some foresee that hybrids will be phased out along with petrol and diesel cars, in fact it was rumoured that some hybrids would be included in the UK's 2040 ban on the sale of petrol and diesel cars.